I love pesto, but there are two things that have gotten in my way to enjoy it lately.....it's winter, so I don't know where you are, but around here fresh basil is non-existent and the second 'problem' is that I am currently not eating dairy--hence no cheese (sigh...) and traditional pesto requires a generous addition of Parmesan or Asiago. Limits fuel my creativity--and cravings even more so. 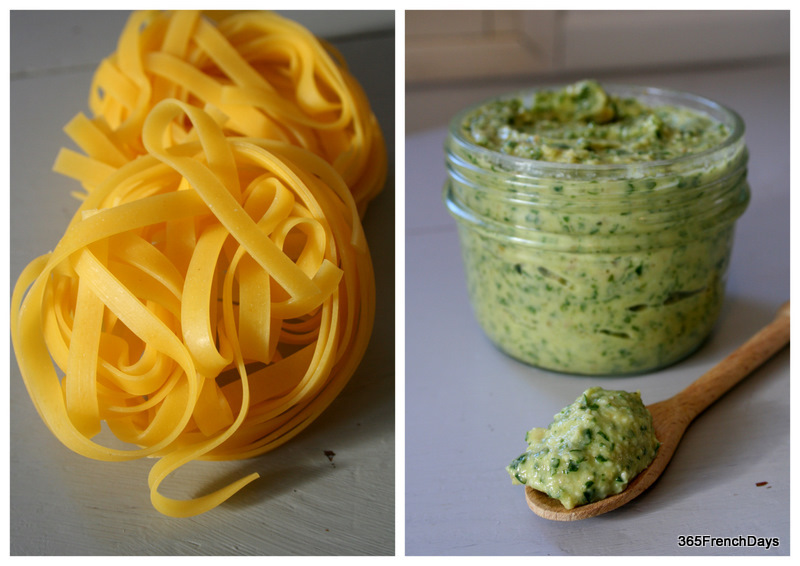 So recently I created my own version of pesto--that is nutty, 'cheesy', sharp and bien sur--green! When summer returns, the same recipe can be adapted-back using basil, and of course you can use Parm or any cheese you like--but try this first without. It's a perfect recipe to set aside in your recipe box for the next time you are entertaining your 'Vegan' friends! 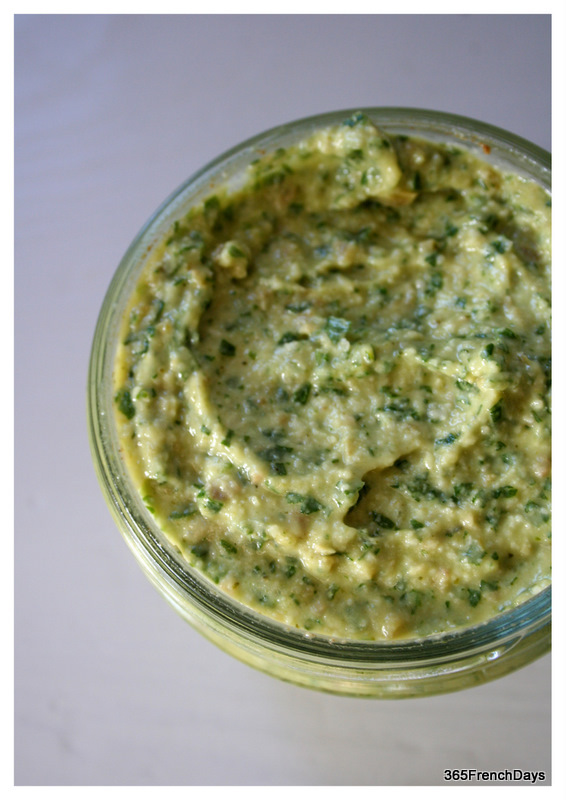 In a food processor blend and chop the Arugula and broccoli with the almond meal. Add the roasted garlic cloves and pulse until consistently smooth. Slowly drizzle in olive oil until it is the desired thickness...about 3/4 cup total. Squeeze in lemon juice and pulse to finish. When I made it this week, I tossed it with grilled shrimp on egg-linguini. We have 'Pasta Night' every Thursday, even here in France--where family-style pasta dinners are less common. It also works perfectly added to risotto, or spread on a baguette and put under the broiler for a minute. I love having a little left-over in the fridge to throw together a last minute appetizer, too! In a tightly lidded jar, it will last about one week....except at our house. Enjoy mes amis! Bon weekend! Thanks Beth! Nice to meet you!